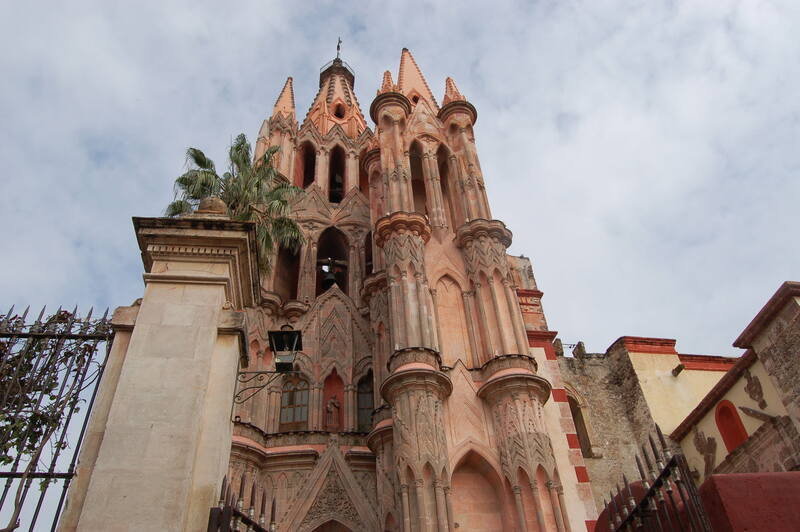 I recently took an amazing trip with my girlfriend to visit the town of San Miguel De Allende in Guanajuato, Mexico. 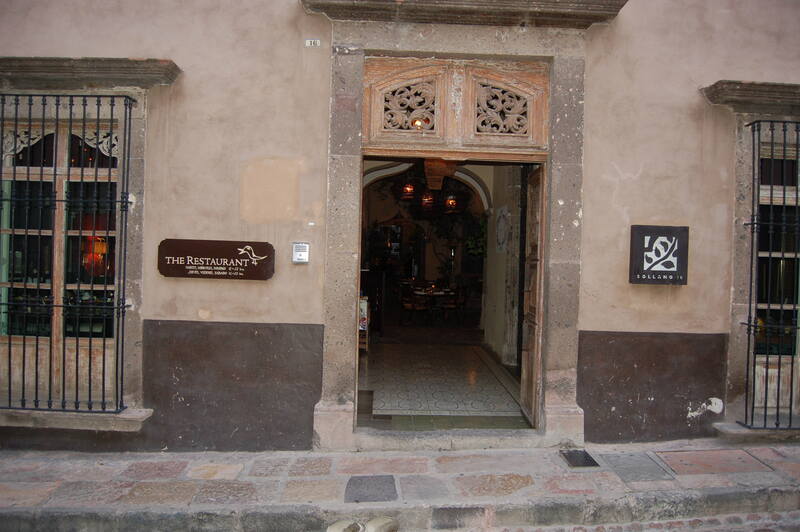 San Miguel is a really cool traditional Mexican town about 3 and a half hours north of Mexico City. There was obviously tons of amazing food to be had like tacos, gorditas, gringas, quesadillas and of course tortas. 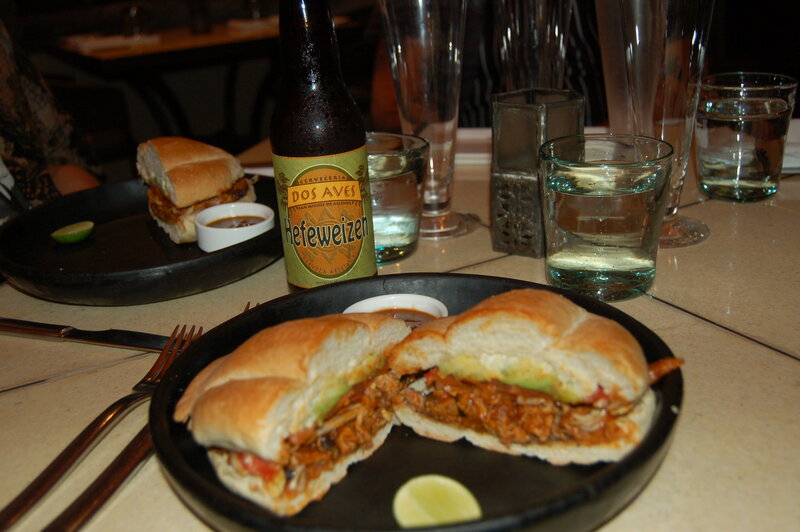 Tortas have long been one of my favourite sandwich styles so the opportunity to try some real Mexican tortas was super exciting! 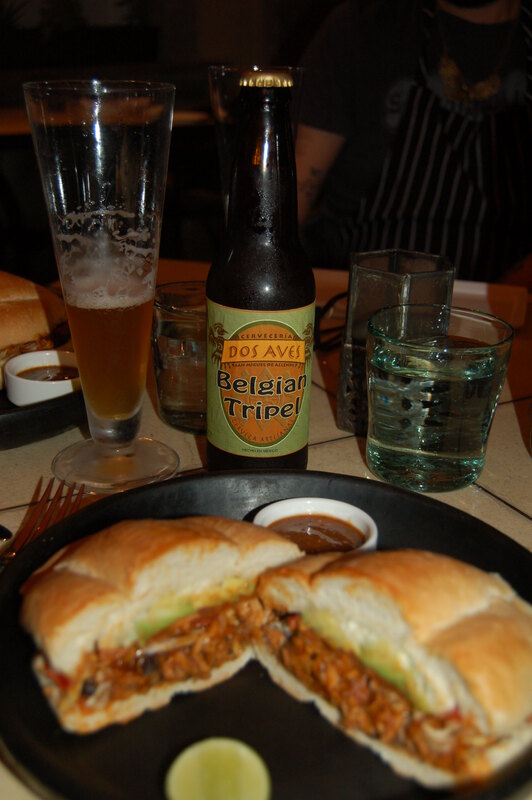 While I was there I got to meet a great chef from a local restaurant who had me in to pair one of his wicked tortas with a craft beer brewed right in San Miguel. 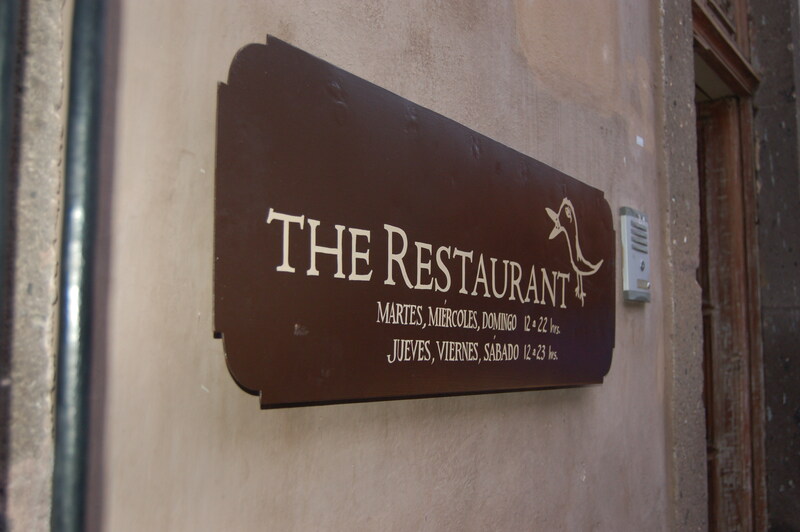 The Restaurant is located just outside El Jardin in the Centro area of San Miguel around the corner from the world famous church La Parroquia. 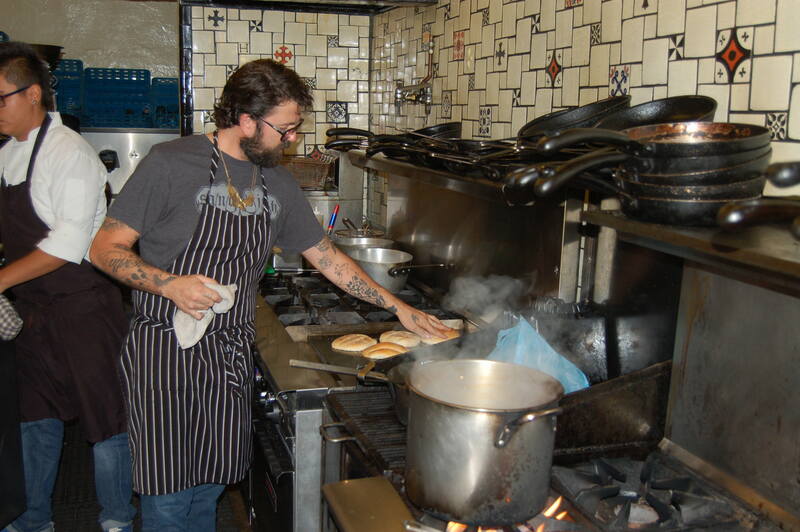 At The Restaurant, Chef Donnie Masterton creates global comfort food with ingredients sourced from local farmers and suppliers. 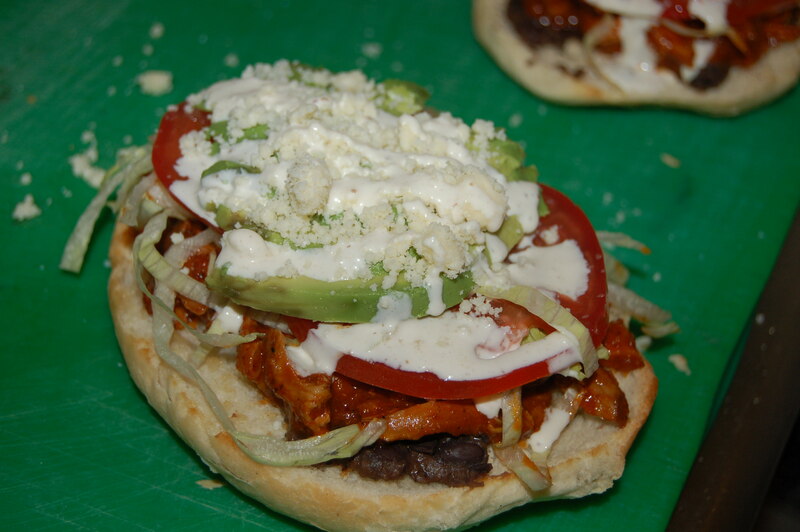 The torta that Chef Donnie came up with on this day was a spectacular Ancho Chili and Tequila Braised Chicken Torta with refried black beans, avocado, lettuce, tomato, onion, crema and quesofresca on a traditional torta bun. 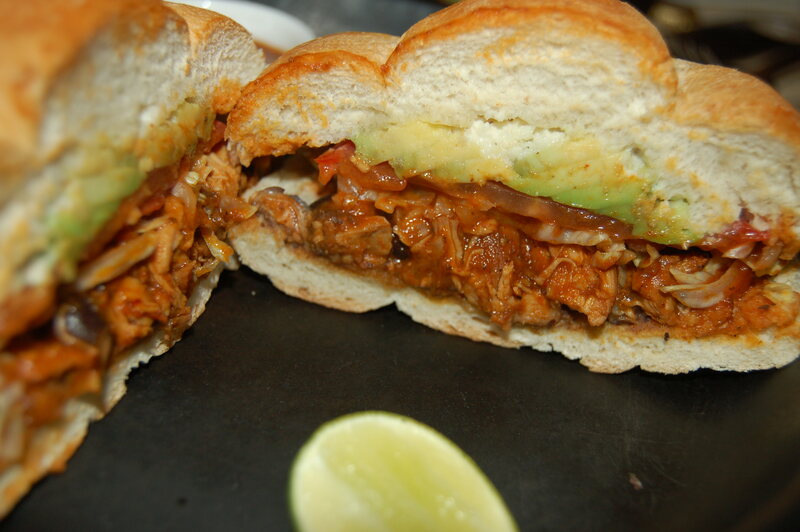 The torta was served with an arbol chili salsa made with arbol chillies, roasted garlic, onion and tomatillos. 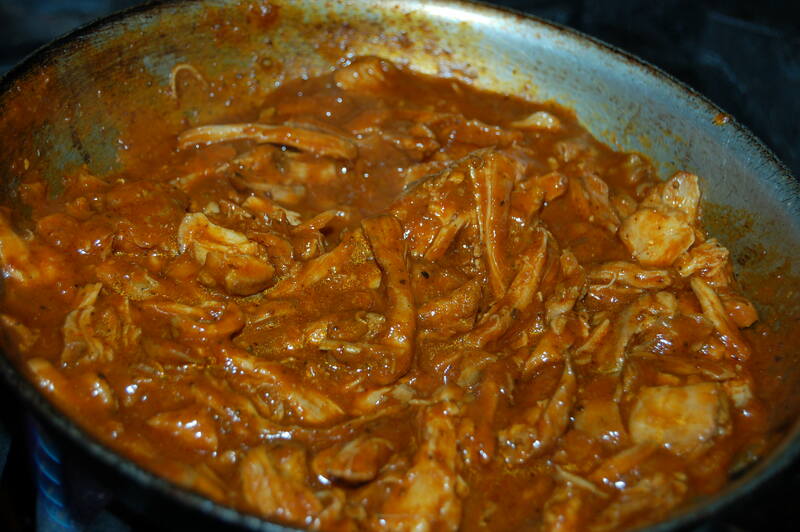 The depth of flavour from the ancho and tequila braised chicken hit the taste buds hard, with a nice amount of heat, smokiness and even a subtle sweetness. I found the tequila acted to mellow the heat from the ancho chillies. 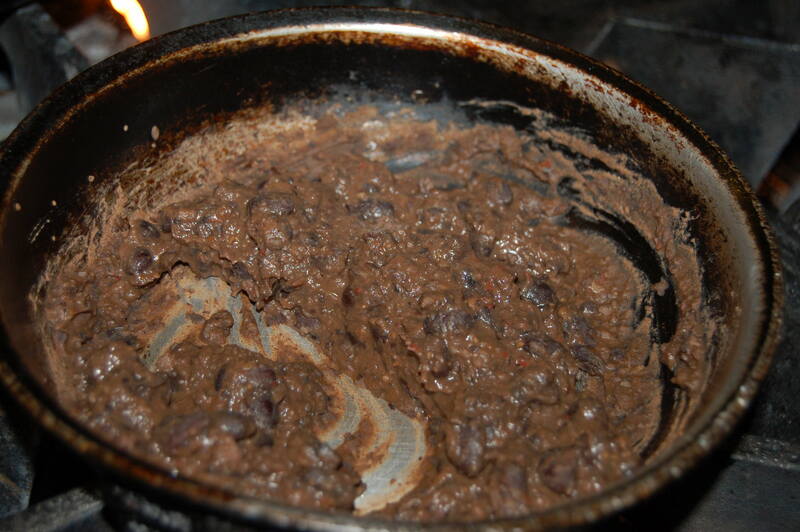 The arbol chili salsa was where the heat was if you wanted it, for me it was a bit too much spice, so it was perfect on the side. 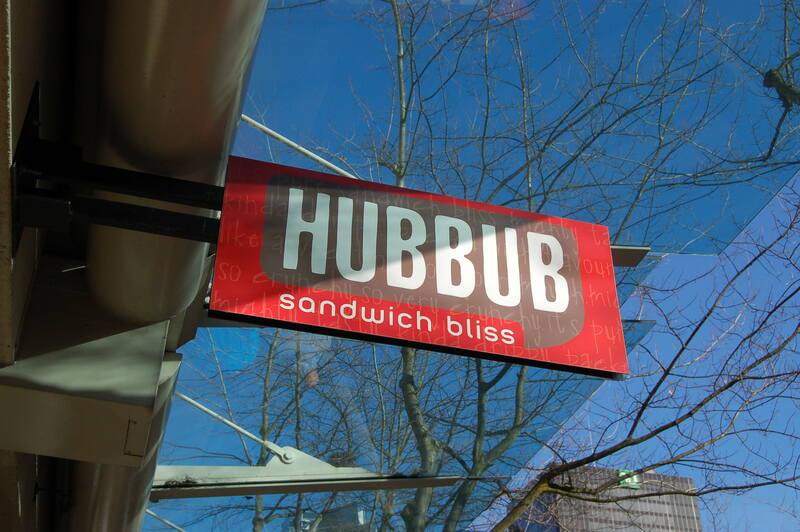 The beans gave the sandwich a great soft texture, which matched up real nice with the crunch from the fresh vegetables. My favourite part of the sandwich I think was the quesofresca, it brought just the right amount of salt to the sandwich while providing another layer of texture. This torta was spot on, hitting every note that makes a torta such a perfect sandwich. While I was in San Miguel I tried to search out as many Mexican craft beers, or cerveza artesenals as they call them, as I could. 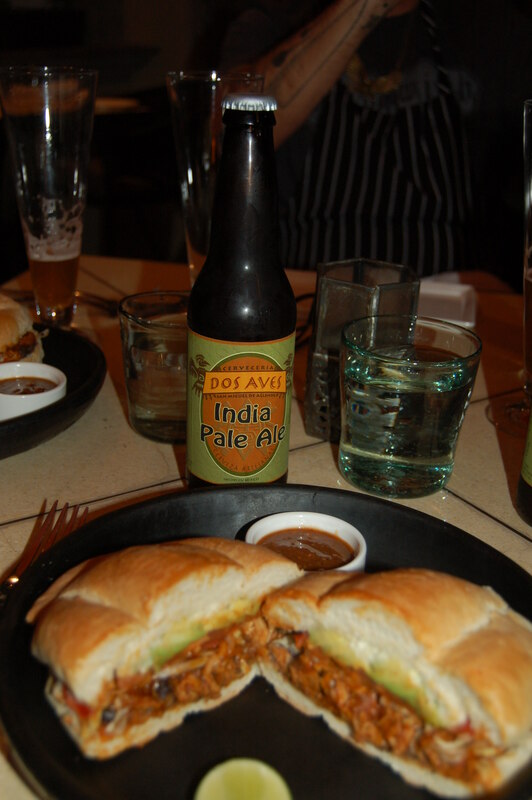 In that search I found out that San Miguel has their very own craft brewery called Dos Aves. Dos Aves offer up a full line of totally awesome craft beers year round including a Pale Ale, an IPA, a Belgian Tripel and a Dry Stout. They also seasonally release a Pumpkin Ale, Russian Imperial Stout, Hefeweizen and an award winning Barley Wine. The Restaurant carries the full line up so we decided to taste each one of the year round releases as well as the Hefeweizen with the torta to see what paired up best. The Pale Ale, IPA and Tripel were all great but didn’t work with the torta as much as the Hefeweizen, which was the stand out. The citrusy notes from this traditional German Hefeweizen couldn’t have been more perfect with the torta. The beer accented the braised chicken finding the tequila and pairing up great, while at the same time mellowing the anchochili and the arbol chili salsa. The fresh crisp mouth feel was great the cleanse the palate between bites, making each bite a whole new experience. 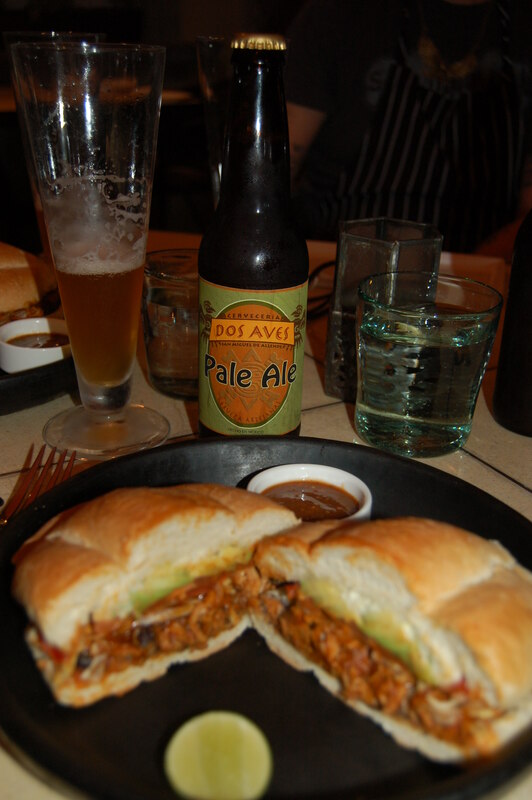 So, if you’re in San Miguel De Allende and you’re looking for a traditional torta paired with super local cerveza artesenal then head to The Restaurant for This Sandwich and That Beer. 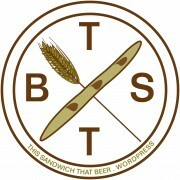 Check out www.therestaurantsanmiguel.com and www.cerveceriadosaves.com for more info, follow them both on Facebook and follow me on Twitter @TSTB_blog. Also look for my article in the bi-monthly newspaper BC Craft Beer News and listen for my feature on Just Here For The Beer radio on Team 1410AM airing December 28th at 12:00pm.